Webster-Kirkwood Real Estate Buzz : New/Old House in the Arts & Crafts Period Style - What an Amazing Home! New/Old House in the Arts & Crafts Period Style - What an Amazing Home! Kirkwood, St. Louis County - If you love the Arts and Crafts style this home is for you. The interior features period style details that you seldom find in new homes. 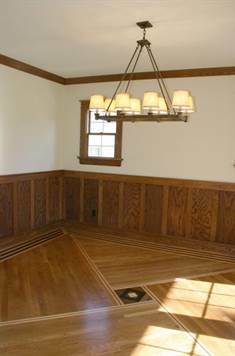 Specialty moldings, wainscotting, and hand-made Arts and Crafts style kitchen cabinets with INSET doors. These cabinets were hand-made by an Amish crew in northern MO and are some of the most beautiful cabinets you'll ever see! You also will rarely find them in a home at this price point...they are that unique! Main floor den/living room can also be used as 5th bed w full bath. Extra deep lot w/ a huge WALK-OUT basement opening to the back yard and covered patio. There is also a large covered deck off the main level that looks out over the private yard and one of the most fabulous trees in Kirkwood. The carriage house garage features a walk-up second level with a rough in for a bath. It could be finished as a fabulous office or rec room. There is also a 25 head sprinkler system installed plus much more! View the Detailed Listing Sheet for room sizes and other features (to the left). Photos will be posted by early June - To be completed by mid-June.